And peace of mind as time passes. In tribute to his/her memory. Written by Alden Solovy. Appears in his book This Grateful Heart: Psalms and Prayers for a New Day from CCAR Press. Congregation Kol Ami recognizes the unconditional love and support our animals effortlessly provide. They become members of our family and their passing can leave a hole in the fabric of our home. Reform Judaism works to fold the realities of our modern lives into the rich tapestry of Jewish tradition. 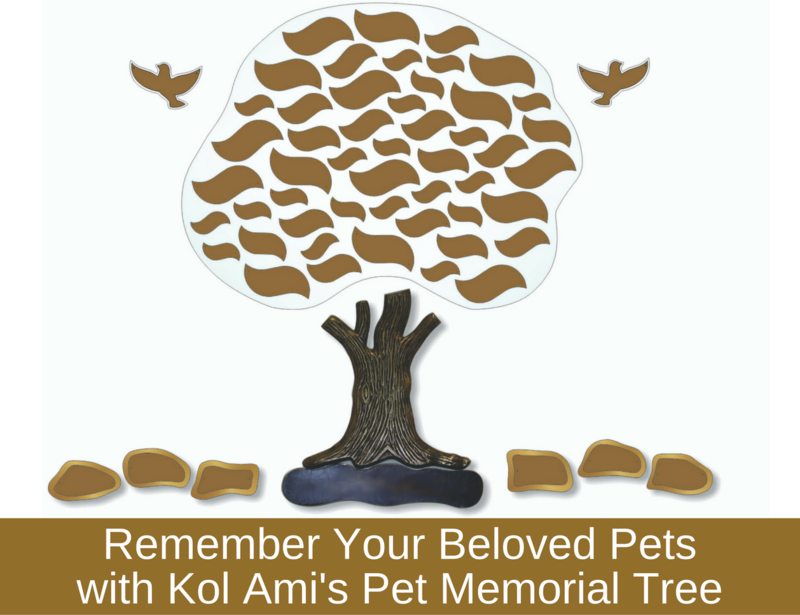 At Kol Ami, we provide a place of honor for our beloved pets in our courtyard garden. It's a beautiful, peaceful, shady spot that we know our pets would enjoy. You can inscribe your pet's first name, date of passing and if you would like, a small message of love on either a gold leaf, stone or dove and have it placed in with love on our Pet Memorial Tree. We have leaves of three different sizes; small, medium and large. Small leaves allow for one line of text, medium leaves allow for two lines of text, and large leaves allow for three lines of text. We also have stones, resting in prominence at the foot of the tree as well as doves soaring beautifully above that both allow for three lines of text. In our courtyard garden, your pets name can be inscribed on a gold leaf stone or dove. Together, it creates a peaceful and beautiful nature setting that honors the memory of a pet's unconditional love. If you have questions, please call us at 323-606-0996 or email us at [email protected]. How many Small Leaves would you like to purchase? How many Medium Leaves would you like to purchase? How many Large Leaves would you like to purchase? How many Stones would you like to purchase? How many Doves would you like to purchase? Please let us know the inscription you would like printed on your first small leaf? Please let us know the inscription you would like printed on your first medium leaf? Please let us know the inscription you would like printed on your first large leaf? Please let us know the inscription you would like printed on your first stone? Please let us know the inscription you would like printed on your first dove? Please let us know the inscription you would like printed on your second small leaf? Please let us know the inscription you would like printed on your second medium leaf? Please let us know the inscription you would like printed on your second large leaf? Please let us know the inscription you would like printed on your second stone? Please let us know the inscription you would like printed on your second dove? Please let us know the inscription you would like printed on your third small leaf? Please let us know the inscription you would like printed on your third medium leaf? Please let us know the inscription you would like printed on your third large leaf? Please let us know the inscription you would like printed on your third stone? Please let us know the inscription you would like printed on your third dove? Please let us know the inscription you would like printed on your fourth small leaf? Please let us know the inscription you would like printed on your fourth medium leaf? Please let us know the inscription you would like printed on your fourth large leaf? Please let us know the inscription you would like printed on your fourth stone? Please let us know the inscription you would like printed on your fourth dove? Please let us know the inscription you would like printed on your fifth small leaf? Please let us know the inscription you would like printed on your fifth medium leaf? Please let us know the inscription you would like printed on your fifth large leaf? Please let us know the inscription you would like printed on your fifth stone? Please let us know the inscription you would like printed on your fifth dove?